1 of 6 Heat oven to 350 degrees . Prepare cake mix with eggs, oil and 1 cup water as per package directions. Transfer to a large resealable plastic bag. 2 of 6 Coat 2 mini muffin pans with nonstick cooking spray. Fill each cup almost to top. Bake at 350 degrees for 16 to 18 minutes. Remove cakes from pan, re-coat, re-fill and bake a second batch. Cool cakes. 3 of 6 Trim cakes level. Transfer frosting to a large pastry bag. Snip tip to create a 1/4-inch opening. Pour 1 tbsp jelly beans or M&Ms into bottom of each cone (see Note). Place 1 cake into an ice cream cone, pressing lightly to fit. Squeeze a little frosting onto cake in cone and place another cake, trimmed side down, into cone. Repeat with all jelly beans or M&Ms, cakes and cones. 4 of 6 Pipe or spread frosting onto cakes to cover. Add eyes and pink beads for noses. 5 of 6 Cut marshmallows in half diagonally and dip cut edges into sparkling sugar. Press into bunnies (to resemble ears). 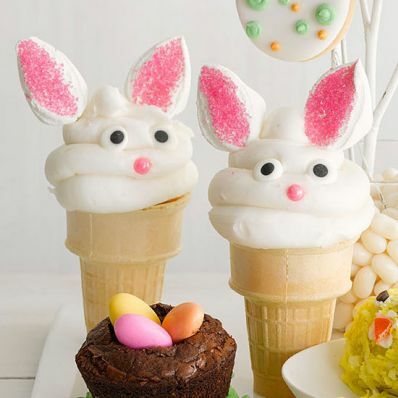 6 of 6 Note: The candies in the bottom of each cone are not just for fun; they help keep the bunnies from tipping over.